Step 1: Parents are required to make the payment of the application fees at South Indian Bank, Bannerghatta Road in account number 0526053000005300, IFSC Code SIBL0000526 and Account name Carmel Academy. Step 2: Mention the same acknowledgement number while filling the application form. Step 3: After successful completion and submission of the Application form, parents are required to appear for the child-parent interaction with the Principal on the day scheduled by the office. A hard copy of the dully filled application form along with a copy of birth certificate should be submitted in the office. Note: Both Parents should attend the meeting. Step 4: If the admission is confirmed by the office, parents are supposed to remit the full admission fees within 7 working days. Failure to do so will result in the cancellation of the enrolment for the said application. 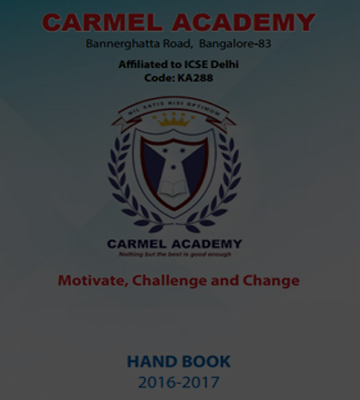 Mere submission of online Application form or any other document does not confirm the admission of aspiring students at Carmel Academy. Fees once paid for the Application form in favor of Carmel Academy will not be refunded in any circumstances. Carmel Academy holds the right to amend any terms and conditions at any point of time considering the well-being of the organization. Any misbehavior/misconduct by the student/parent/guardian will lead to temporarily suspension of the student at the discretion of the Principal. The objective of this website is to facilitate the parents of our students to make them aware about the updates of the school. Parents are requested to log in from time to time and obtain the required information from the website. The user holding an account on this website shall be responsible for the confidentiality of the credentials like User Id and Password. If any information provided is found be untrue or inaccurate, the school shall have the right to deactivate the account immediately. In case of any query, you may please contact our school at +919620165722 or write to us at info@carmelacademy.in.